Rany on the Royals: Top Moments (#80 - #71) of the 2014-2015 Kansas City Royals. Top Moments (#80 - #71) of the 2014-2015 Kansas City Royals. This set of ten Moments commences with the most important wild pitch in franchise history, continues with a handful of iconic defensive plays, wraps up with a pair of game-icing home runs, and concludes with an event so unlikely it nearly broke the space-time continuum. And we still have 70 Moments to go. Summary: In the midst of the Royals’ furious 8th-inning comeback in the Wild Card Game, Luke Gregerson throws a wild pitch to score a run and moving the tying run to third base with one out. 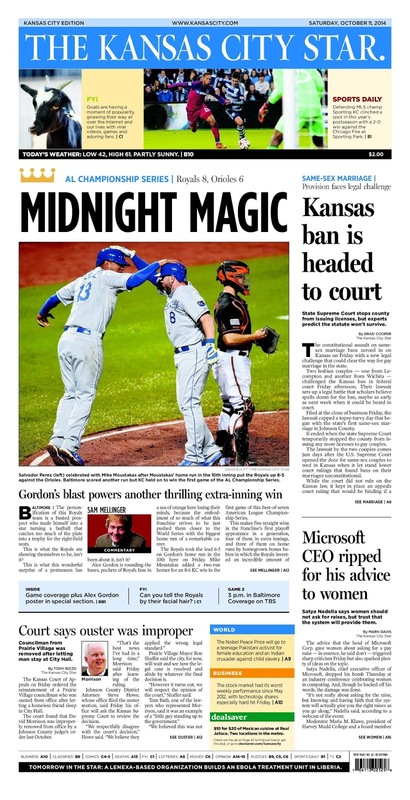 When did I start to believe that the Royals not just could, but would, win the Wild Card Game? Probably around the time that Luke Gregerson bounced a slider to Alex Gordon in the dirt. Billy Butler had just singled to drive in the second run of the inning and bring the Royals to within two; Terrance Gore had pinch-run for Butler, and on the first pitch to Gordon, Gore stole second base (Moment #173) like it was nothing. Eric Hosmer was already on third base, so Gore represented the tying run, meaning that all the Royals had to do was bring home The Fastest Man In Baseball from scoring position. But thanks to this wild pitch, the Royals exited the inning down only one run instead of two. And while Gore’s stolen base was ultimately in vain, the Royals had another ace baserunner up their sleeve. Summary: Lorenzo Cain makes a spectacular catch look routine, taking extra bases away from J.J. Hardy in a tie game in the 6th inning. Yost left Ventura in to start the sixth because he wanted to watch Cain do that. Summary: Lorenzo Cain makes a tough catch look easy, taking extra bases – and at least two RBIs – away from J.J. Hardy in a tie game in the 7th inning. …Hardy again batted in a tie game, this time with two outs and the bases loaded, thanks to some uncharacteristic struggles by Kelvin Herrera. First Herrera somehow missed the first base bag after receiving the toss from Eric Hosmer on a routine groundball by Nick Markakis leading off the inning. Then Herrera walked Alejandra de Aza on six pitches, and the Orioles had first-and-second with no outs. Adam Jones struck out, but Nelson Cruz punched a grounder through the left side to load the bases with one out. Fortunately, Herrera got the star-crossed Steve Pearce to fly out to shallow left field, where no one would be foolish enough to test Alex Gordon’s arm, before Hardy lined an 0-1 pitch down the right field line. But in the top of the 7th, Jarrod Dyson had pinch-run for Nori Aoki, and when the bottom of the inning started he was in center field and Cain had moved to right. So the Royals had an exceptional defender in right field, who was also shaded towards the line, in part because the presence of Dyson in center made it possible for Cain to play there. As a result, the catch itself wasn’t particularly dramatic, although Cain finished it with a dramatic 540-degree flourish. But the catch didn’t need to be dramatic only because of the defensive dominance of the Royals outfield. And the catch had an enormous impact on the game; if the ball drops, the score is 8-6 or 9-6, the Orioles probably win, and the whole series plays out differently. Summary: …and then Cain makes a spectacular sliding catch to rob Howie Kendrick as well. "For maximum strength pain relief, try Lorenzocaine!" These plays are inseparable, coming as they did on back-to-back batters, so it would be inappropriate to discuss them separately. Unlike Cain’s catches in Baltimore, these two catches didn’t come at a critical time, coming as they did in a game the Royals led by five runs in a series they led 2 games to 0. But what they lacked in impact they made up for in visual aesthetics, and in the way they seemed to announce to the world that the Royals were for real: that they played defense better than any other playoff team did anything. First Cain went to his right to rob Pujols, diving headfirst to make the play. Then he went to his left slightly, but mostly straight in, one of the most difficult reads for a centerfielder to make, and robbed Kendrick by sliding feet-first. Cain then got up and flexed his arms so impressively that he also won the Mr. Olympia competition. Even James Shields was in disbelief by the end. It was the complete array of Cain’s skill set demonstrated in the span of two batters, and to whatever extent the Angels still thought they were alive in the ALDS, I’d like to think these two back-to-back catches also robbed them of whatever was left of their morale. More to the point, these two catches made the rest of baseball sit up and take notice: that not only were the Royals a very dangerous playoff team, they were an absolute joy to watch. Summary: Alex Gordon crashes into the wall but holds on to the ball, making a sensational catch to preserve a one-run lead in the 2014 ALCS finale. It’s no wonder J.J. Hardy had such a bad season in 2015. You would have too if you couldn’t get a good night’s sleep the entire winter before. With the Orioles in desperate straits, down 3 games to 0 and losing by a run in the 5th inning of Game 4, Hardy scalded a 1-2 fastball from Jason Vargas over Alex Gordon’s head in left field. But not over Gordon’s glove. Gordon made the over-the-shoulder catch at full speed less than two steps from the fence, and not the padded portion of the fence – the chain-link cover over one of the display boards out there. A collision with that wall was going to hurt, and it did, knocking the wind out of Gordon. But he held on to the ball. The Royals held on to the lead. And despite being unable to score any insurance runs against Baltimore, the Royals held that lead all the way to the end. "How can we take WAR seriously when it ranks Alex Gordon as one of the best players in baseball?" - no one ever again, I hope. Summary: With the score tied in the bottom of the 12th in the Wild Card Game, Christian Colon steals second base on a pitchout – and is safe when the pitch bounces out of the catcher’s glove. We don’t talk enough about this play when we talk about the Wild Card Game, or about what a charmed existence this franchise has lived these past two years. The Oakland A’s knew Christian Colon was going. They pitched out. Do you know how rarely teams pitch out these days? I didn’t, until Ben Lindbergh wrote about it for FiveThirtyEight recently, and pointed out that the frequency of pitchouts has dropped by over 75% in the last 25 years. During the regular season, Bob Melvin called for 16 pitchouts – total. Over the last three seasons combined, he’s called for 44 – less than 15 per season. The A’s pitch out less than one time every ten games. And yet, with the Wild Card Game tied in the bottom of the 12th inning, the A’s pitched out, and guessed correctly. What’s more, they pitched out against Christian Colon, who isn’t exactly Terrance Gore on the bases. Colon is 5-for-7 (71.4%) in stolen bases in his brief major league career and 71-for-99 (71.7%) in his minor league career; his career high for steals in a season is 18. He’s a decent stolen base threat, but he’s exactly the sort of guy where guessing right on a pitchout should be the difference between probably being safe and probably being out. And he was safe anyway, because Derek Norris dropped the ball. On the replay, you can see that as the pitch reaches his glove he’s looking out towards second base, presumably at Colon, rather than at the baseball. This is what I meant when I said that when it came to stealing bases, the Royals were totally in the A’s heads by the end of the game. Norris was focused on the wrong thing, and literally dropped the opportunity to end the inning by throwing Colon out at second base. Two pitches later, Salvador Perez ended the game instead. Summary: Mike Moustakas ices the opener of the 2014 ALCS when he hits the Royals’ second homer of the 10th inning. Game 1 of the 2014 ALCS is perhaps the most underrated of all 22 of the Royals’ postseason victories, a game in which the Royals blew a 4-1 lead in the 5th, failed to score in the top of the 9th in a tie game after loading the bases with none out…and managed to win anyway. Alex Gordon had already put the Royals ahead when he led off the 10th with a home run off of Darren O’Day, but after Salvador Perez walked and Omar Infante struck out, Buck Showalter called on left-hander Brian Matusz to face Mike Moustakas. Moustakas worked the count full and then Matusz threw a 90 mph meatball up and right over the plate. Moustakas may have still only been a mistake hitter before his rebirth as an all-fields hitter the following season, but he knew what to do with a mistake. The two-run homer gave Kansas City an 8-5 lead, and those two insurance runs proved crucial when Greg Holland gave up a single, a walk, and an RBI single with two outs in the bottom of the inning before closing the game out. Bonus highlight: after the home run, it’s the first appearance of Sad Orioles Chick! I know I’m a terrible person for saying this, but after a generation of being bullied, there has been a sense of giddy disbelief these past two Octobers seeing the images of so many people on the other side – players or fans – who are having their dreams crushed by the Royals. Sad Orioles Chick, who the internet tells me is actually named Morgan Sebach, became a staple of the ALCS, in part because she was at every game – and kudos to her for traveling to Kansas City for Games 3 and 4, I have nothing but respect for her commitment to her team – and in part because the cameras would turn to her for her reaction every time the Royals smacked the Orioles down. Which was pretty much all the time. 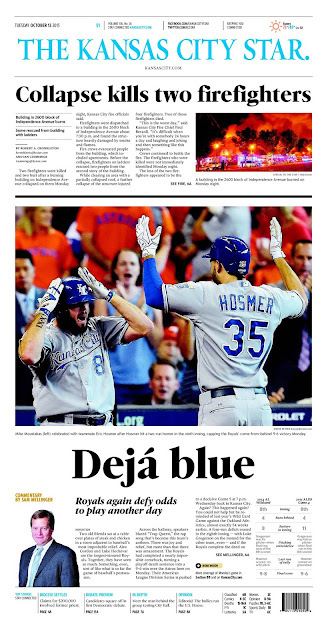 Summary: Eric Hosmer completes the Columbus Day Miracle, hitting a two-run homer to ice Game 4 of the ALDS an inning after the Royals stared elimination in the face. But in the top of the 9th, Eric Hosmer decided to remove even that exceedingly unlikely situation from happening. With Lorenzo Cain Ben Zobrist on first and one out, Hosmer hit Josh Fields’ 2-0 fastball a very loooong way. Minute Maid Park is a good home run park, but that is because the fences are short down the lines; out towards center field it is much deeper, including the area around Tal’s Hill which gives it the deepest centerfield in the major leagues. Hosmer hit this ball to a very deep part of the ballpark, but still managed to drop it in the bullpen, a drive listed at a prodigious 452 feet. (The exit velocity off the bat was 105 mph, which was actually slower than Hosmer’s line drive off of Javier Lopez in Moment #84. That’s how hard Hosmer hit that single.) This was the only home run he hit during the 2015 playoffs, and while it didn’t come at the most crucial moment, it was still a pretty big hit. Most of his hits are. Summary: Billy Butler stole a base. In a major league game. A playoff game. I swear. There were witnesses and everything. I DIED. I JUST DIED. I MUST BE IN HEAVEN. BILLY BUTLER STOLE A BASE. Billy Butler stole second base. Seriously, what else do you need to know? The Royals had just broken open Game 3 of the ALDS against the Angels on Eric Hosmer’s two-run blast (Moment #87), so this stolen base wasn’t really necessary. And Butler didn’t score after Alex Gordon grounded out and Salvador Perez struck out to end the inning, so this stolen base wasn’t really productive. But in response, all I have to say is Billy Butler stole a base. In a playoff game. Butler did not steal a base during the 2014 regular season. He did not attempt to steal a base during the regular season. Butler did not steal a base in 2013. He did not attempt to steal a base in 2013. Butler did not steal a base in 2015. He did not attempt to steal a base in 2015. In the last three seasons, Billy Butler has attempted to steal a base only one time. This is that one time. And he was safe. Against a left-handed pitcher. Hector Santiago isn’t a particularly easy pitcher to run on – during the season, runners were just 10-for-17 (59%) in stolen base attempts. But Butler went. And he was safe. This moment didn’t make sense. Not one person in the stadium that day thought it made sense. Look at Butler flashing Jarrod Dyson’s “vroom vroom” sign. Then look at the cutaway to the fans in the stands. Then see them cut away to Dyson and Yordano Ventura flashing the sign back at Butler. The picture of those two remains one of the most joyful images of the past two years. It radiates pure joy, adulterated perhaps only by sheer disbelief. Billy Butler stole second base. It didn’t matter at all in the end. But to this day it serves as the perfect emblem of the last two seasons. The moment didn’t make any sense. I still can’t believe it really happened. Just like I still can’t believe the 2014-2015 Royals really happened. I think the best part of this project (so far) is being re-immersed in the crazy Royals Devil Magic of the 2014 post-season. I've struggled with some of these highlights, because no matter how happy the individual moments were, I knew it all ended 90 feet short of home and with disappointment. For some reason, this particular series of highlights moved me past all that and reignited my love for the out-of-nowhere 14 team and all those WTF! defensive plays and the sheer delight of just being there to see it unfolding. The unexpected rollercoaster ride of 2014 was a very different feeling than the fate-filled magic potion of 2015. It's easy to love a winner. Watching these highlights make me happy I still wear my 2014 Royals WS shirt. I've never loved a team that didn't win it all more. Thanks again for this Rany. The Butler steal is one of the most memorable moments of the past two years, agreed, and I had the joy of attending that game. The entire stadium was in disbelief. As for the play you forgot, maybe you can write a Forgotten Five (or 15 or 50 or whatever is appropriate) after this series is over? Rany, I love the series. It is a great way to relive it all while waiting for this year's memorable games. I am also saving all these on my computer. I did find an error, however, you state that Hosmer drives in Cain with his 2-run shot in Houston, but watching the video it is clearly Zobrist waiting for him at home. Moment #72 was beautiful. The highlight shows Hinch writing something down after the bomb. I imagine it said, "Note to self: Don't pitch to Hosmer."